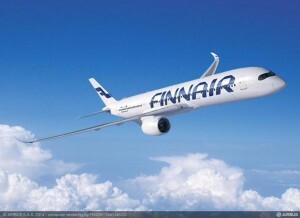 Finnair has firmed up the eight Airbus A350 XWB aircraft options in its 2006 A350 order placed with Airbus. The eight A350s will be delivered to Finnair starting in 2018. At Airbus list prices, the value of the additional eight A350 aircraft would be approximately 1.9 billion euro. The firm up of the options increases the total number of Finnair’s A350 orders to 19. Finnair’s current long haul fleet consists of seven A340 aircraft and eight A330 aircraft. The long haul fleet is planned to grow, on average, by one new-generation energy-efficient aircraft per year between 2016 and 2020. Based on the current delivery schedule of A350s Finnair will receive the first four aircraft in the second half of 2015, seven A350s between 2016 and 2017, and eight A350s between 2018 and 2023. Finnair plans to phase out its A340 aircraft by the end of 2017, following the successful delivery and entry into service of A350 XWB. As a part of the deal Airbus has also agreed to acquire four A340-300 aircraft currently owned by Finnair in 2016 and 2017. ‘’We share a long-standing relationship with Finnair and are delighted by this renewed confidence in our Widebody family. The A350 will integrate very well into Finnair’s all Airbus fleet. Finnair will benefit from latest technologies and efficiency levels, enhanced by the unique fleet commonality only Airbus offers,’’ says John Leahy, Airbus Chief Operating Officer – Customers. The transactions announced today are a part of Finnair’s long haul renewal program. Within this program, Finnair has already announced sale and leaseback agreements for four A330 aircraft (closed in the first half of 2014), the sale and leaseback agreement of the first two A350 aircraft (expected to close upon delivery of these aircraft to Finnair in the second half of 2015). As a whole, the combined impact of the A340 transaction announced today and the aforementioned sale and leaseback agreements is not significant to Finnair’s operating profit in 2014 and 2015, when gains and losses for selling these aircraft, the related relevant operating costs as well as transaction costs are taken into account. Finnair is evaluating various financing options for the remaining A350 deliveries and will communicate more on that in due time. Next articleThe Air France A380 lands in Miami!